Care to look around? We've got fantastic field trips planned as part of this year's Festival. Take a look below at all our options. Reservations and pre-payment are required for field trips, so reserve your spot early! Make your reservation according to the instructions for your desired field trip. spaces are limited and many adventures will sell out early! Note: All proceeds from this activity will go directly to the Florida Panther Festival to help fund the festival. Description: Join a CREW Land & Water Trust staff member for a guided hike along three miles of trails that are home to panthers, deer & black bears. We'll explore panther habitat and you'll complete a "Panther Passport" as we look for and talk about panther lifestyles, how they raise their young, and signs of all kinds of animals along the way. We'll share how panthers are using the CREW watershed and why protecting these lands are important to the quality of life in southwest Florida. The CREW Marsh Trails are the northernmost section of the Corkscrew Regional Ecosystem Watershed (CREW) which is owned and managed by the South Florida Water Management District. These trails wind through pine flatwoods, oak hammock, sawgrass marsh and popash slough. Come see the beauty of CREW! From Naples/Bonita Springs/S. Ft. Myers: Travel I-75 north to exit 123 (Corkscrew Road). Travel 18 miles east on Corkscrew Rd. You will pass the Cypress Dome Trails. Go another 4 miles and you will see the CREW Marsh Trails on your right. Look for the brown trailhead signs. From N. Ft. Myers/Charlotte Co./Lehigh Acres: Travel I-75 to exit 138 (ML King/SR82). Travel east on SR82 20 miles toward Immokalee. Watch for a small blue CR850 sign, and turn right onto CR850 (Corkscrew Road). The Marsh Trails are about 2 miles down the road on your left. Look for the brown trailhead signs. Limitations: Must be able to walk about 3 miles and be on your feet for three hours in the outdoors. Additional Information: There is one port-o-potty available at the trailhead. There is no running water. What to Bring: Water, snack (if desired) sun protection, cameras, binoculars, field guides. What to Wear: Clothing appropriate for the weather, hat, comfortable hiking shoes. 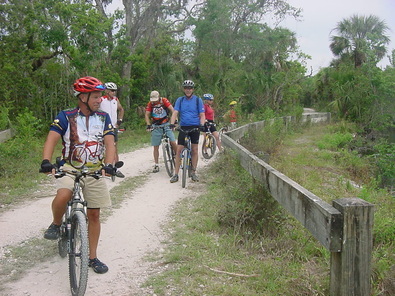 Description: Bike through the diverse habitats of Big Cypress National Preserve’s Bear Island Unit. 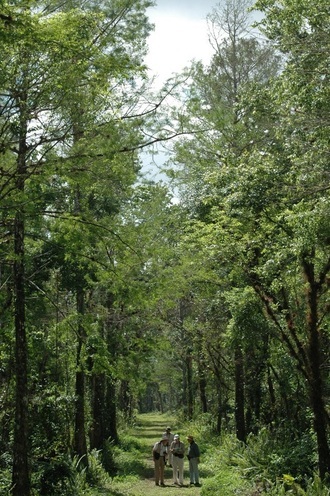 This area is used as home range by the elusive Florida panther and a variety of other wildlife. Along your leisurely 14 mile ride, stop with a ranger at several stations to look for signs of panther, learn about their habitat, find out what Big Cypress biologists do to study the big cat and other interesting facts about Florida panthers. Keep your eyes peeled, as we often see panthers on this trip! 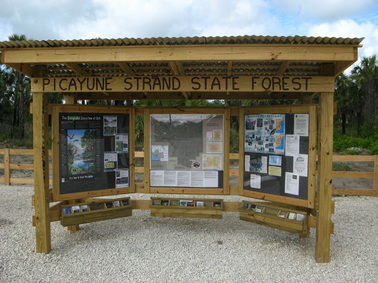 Where to Meet: Big Cypress National Preserve Bear Island Entrance on hwy 29. Arrive by 8:15 to have time to unload bikes, air tires, etc. and be ready to bike at 8:30. Take Hwy 75 to exit #80 (SR29); go north. Travel four miles north on SR29. On the right hand side you will see a gate in the fencing and a sign "Panther Bike Ride". Pull through the gate to park. Limitations: Must be 12 years of age or older and able to bike 14 miles in hot conditions. Must be able to ride a bike for at least 4 hours - we will be stopping for several breaks. Additional Information: Must have a "fat tire" type bike - mountain or hybrid bicycle. There are no restrooms at the trailhead. Limited restrooms throughout trip. Bring a lunch that does not have to be kept cold and will fit in your backpack. We will have a picnic out in the field and will not return to the cars for lunch. What to Bring: Bike, water, snacks, sack lunch, bug spray, camera and binoculars. What to Wear: Cool, comfortable clothing for biking; sun protection (hat, sunglasses, sunscreen). Dress for the weather; Closed toe shoes are highly recommended. Questions? Call Lisa Andrews at 239-695-1164 or email her: lisa_andrews@nps.gov. 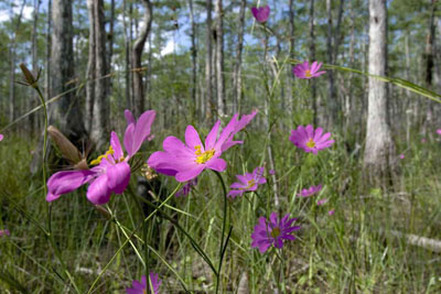 Description: Learn the history of the Picayune Strand State Forest from members of the Florida Forest Service. Participants will take a van tour of the forest and visit one of the sites where efforts are underway to restore the flow of water into the numerous bays of the Ten Thousand Islands area. The Picayune Strand Restoration Project is the site of the first of many Comprehensive Everglades Restoration Projects, and is a federal project occurring, in part, on state-managed lands. Restoration is occurring to correct the miles of roads and canals placed here for the ultimate 'Swampland in Florida' scam during the 1960s-1970s. The tour includes stops at key areas to learn about the flora and fauna of the area and management efforts to ensure the viability of the forest for generations to come. Discussion will include information about this area as critical habitat for Florida panthers. Participants will see and learn about the importance of fire in Florida’s ecosystems. Depending on water levels at the time of the trip, we may include at least one short hike of ½ mile to visit one of the forest’s signature old cypress trees. Where to Meet: Picayune Strand State Forest Field Office (2121 52nd Ave. SE, Naples) (http://goo.gl/maps/EbDf3). From I-75: Take Exit 111 (Immokalee Road), turn left (East) on to Immokalee Road, and drive 3.3 miles east to Collier Boulevard (CR 951). Turn south (right) and drive 3.1 miles to Golden Gate Boulevard. Turn left onto Golden Gate Boulevard and drive 8.9 miles to Everglades Boulevard. Turn right on Everglades Boulevard and drive 6.1 miles to 52nd Ave. SE. Turn right on 52nd Ave. SE and go 1.2 miles until you see the field office on the right. From Naples: Turn on to Golden Gate Boulevard (Note: Do not confuse Golden Gate Boulevard with Golden Gate Parkway) and drive 8.9 miles to Everglades Boulevard. Turn right on Everglades Boulevard and drive 6.1 miles to 52nd Ave. SE. Turn right on 52nd Ave. SE and go 1.2 miles until you see the field office on the right. There is no public access to the forest from I-75 . Limitations: The tour includes light hiking over uneven ground and may not be appropriate for all persons. Additional Information: Restrooms are available for use at the field office prior to the start of the tour. No restrooms will be available during the tour. What to Bring: Lunch, water, sunscreen, bug repellent, walking stick, binoculars, camera, and lots of questions. What to Wear: Please monitor the weather and dress appropriately. Expect to be outside in the sun for significant portions of the tour. Long pants are recommended because we will hike in lightly wooded areas. Tennis shoes, hiking shoes or other close-toed shoes are highly recommended. Please do not wear sandals or flip-flops. A hat, sunglasses and other sun protection are similarly recommended. Description: Join refuge staff and volunteers for a glimpse into the closed portions of the Florida Panther National Wildlife Refuge where panthers roam and deer browse. Participants will join a Refuge Biologist on a 90-minute hike to learn about panther management and research on the refuge while searching for panther signs and using telemetry equipment to determine if any panthers are in the area. 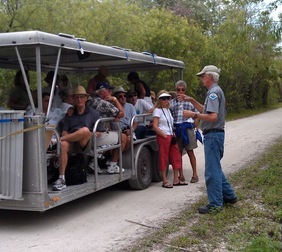 A 90-minute swamp buggy tour will give participants a high view of the terrain to look for wildlife while learning about refuge management and the importance of the refuge to overall panther population health. Participants will be split into two groups at the beginning of the day; one group will go on the hike while the other goes on the buggy tour and then the groups will flip. Where to Meet: Meet at 7:45 AM at the Roth Work Center located 3/4 mile north of I-75 and SR80 interchange (exit 80 off I-75). From Naples: Head east on I-75 (Alligator Alley) toward Ft. Lauderdale, FL. Take Exit 80 for SR 29. Turn left (north) on SR29 toward Immokalee, FL. Cross over the interstate and continue for about 3/4 mile. The entrance to the refuge work center is on the west side of the road (left): there is a black mailbox at the driveway entrance. Drive through the gate and along the path until you reach the pond on the left and park there. Please allow approximately 30 minutes driving time from Exit 101 in Naples (CR951/Collier Blvd. exit). From Everglades City: Take SR 29 north approximately 21 miles to the refuge workcenter. The workcenter is located on the west side of SR29 approximately 3/4 mile north of I-75. The entrance to the refuge work center is on the west side of the road (left): there is a black mailbox at the driveway entrance. Drive through the gate and along the path until you reach the pond on the left and park there.Please allow approximately 30 minutes driving time from Everglades City. Limitations: Participants must be physically able to climb up and down a ladder onto the swamp buggy and to walk for more than one mile. Additional Information: There is a port-a-potty at the refuge trailhead and restrooms will be available halfway through the tour and again at its conclusion. Restrooms are not available on the buggy tour or the hike. What to Bring: Binoculars, water, snack, sunscreen, insect repellent, camera. There are no concessions available at the Refuge. What to Wear: Clothing appropriate for the weather. Long pants are recommended: closed-toed shoes required. Do not wear sandals or flip-flops. 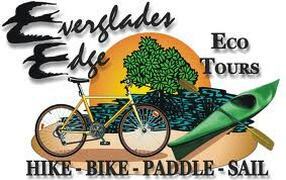 Description: Explore the Picayune Strand State Forest by bicycle! The Picayune Strand is the largest single project in the Comprehensive Everglades Restoration Project. Once sold as high-profile real estate, this important piece of land was re-acquired by the state and is once again home to Florida panthers, deer, black bear, alligators and other wildlife. Where to Meet: Meet at the Trail Walker parking lot on Sable Palm Road, located approximately 5 miles east of CR951 (Collier Blvd) in suburban Naples. Directions to Meeting Place: From downtown Naples: Travel US41 south approximately 7 miles to CR951/Collier Blvd. Go north on Collier Blvd. approximatel 2 miles and turn right onto Sable Palm Road (the first right after the community of Verona Walk). Limitations: Participants must be physically able bicycle on a leisurely ride for 2-1/3 to 3 hours. Additional Information: There is a port-a-potty at the trailhead, and no other facilities are available during the tour. We provide the bikes, helmets, water, snacks and sandwiches, sunscreen and bug spray. We'll take short snack/drink breaks at a shady spot along the trail. Have a particular interest in some aspect of the Picayune? Let us know, and we'll do our best to accommodate your interests! What to Bring: Bring a curious mind and fun attitude (along with sturdy shoes - no flip flops or sandals!). Our fat bikes use platform pedals, but we can change out to clip-ons if requested in advance. You may also wish to bring along a camera. What to Wear: Hiking clothes (or bike riding attire, if preferred), as appropriate for the weather. We also suggest eye protection, such as sunglasses. Closed-toe shoes are required: please do not wear sandals or flip-flops. How to Register and Pay: Register for this adventure by calling Wes Wilkins at least 24 hours in advance at 239-280-8837. 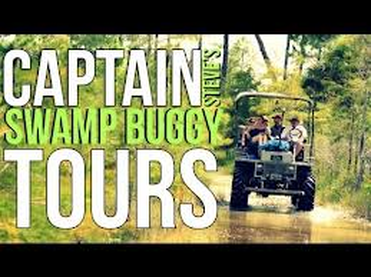 Description: Join 5th generation "Gladesman" Captain Steve for 3-4 hours aboard an authentic swamp buggy. Learn about the ecosystems of the Florida everglades, past and present uses of the Big Cypress Preserve, and the plants and animals that live and grow in no other place in the world. Enjoy beautiful Everglades scenery as you watch for birds, alligators, deer, Florida panthers and other wildlife. Where to Meet: Big Cypress National Preserve in Ochopee, Florida: please us the link below to register and obtain directions to the exact tour departure location. Allow at least 1 hour for travel time from the downtown Naples area. Directions to Meeting Place: Please use link below to obtain directions to the tour departure location. Limitations: Must be able to climb a few steps onto a swamp buggy and be able to travel on a sometimes very bumpy ride on unpaved terrain. Additional Information: Restrooms and concessions are not available on this tour. Water is provided and you may bring along any snacks you like. idea: sunglasses, hats with brim, sun block, etc. What to Wear: Clothing appropriate for the day’s weather is needed. Along the trail, you may wish get off of the swamp buggy and walk around. Protective footwear, that you do not mind getting wet, is a good idea (please, no flip-flops or sandals). 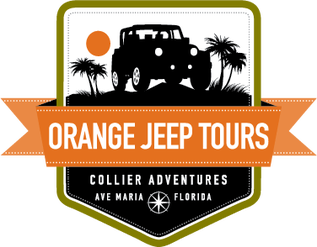 Description: Orange Jeep Tours are Collier County’s newest eco-adventures, navigating visitors through environmentally-protected wetlands, uplands, and preserves giving outdoor enthusiasts up close sightings of native wildlife, flora and fauna in the Camp Keais Strand area. Local outdoorsman and nature enthusiast, Gavin Wuerth, narrates a fact-filled exploration while incorporating much of the history of the local area, including Seminole Indians, Barron Collier, and more. Enjoy 90-minutes in a custom-outfitted, open-air Jeep in Southwest Florida’s backyard. Where to Meet: The Jeep Tours will leave from the Ave Maria Information Center located at 5076 Annunciation Circle # 104, Ave Maria, Florida. Directions to Meeting Place: From Naples: Take Immokalee Road east to Oil Well Road (about 13 miles east of I-76) and follow Immokalee Road to Ave Maria. Make a left and follow Ave Maria Blvd north to Annunciation Circle. Make a right and look for the Ave Maria New Home & Welcome Center on your right. Limitations: Must be able to climb into Jeep Wrangler and ride on unpaved terrain. Additional Information: Restrooms available at beginning and end of the Orange Jeep Tour. Restaurants are located within a short walking distance of Orange Jeep Tour office. What to Bring: A bottle of water is always a good idea and of course a camera to capture the beautiful sights! Also bring sun protection (hat, sunglasses, sunscreen). How to Register and Pay: Please call 239-434-Jeep (5337) to make reservations and mention you are participating in the Florida Panther Festival. Orange Jeep Tours will take a credit card number at time of reservation but not charge your card until the day of your tour. Description: Join a Corkscrew Sanctuary naturalist to learn about Florida Panthers, including the individual cats that are known to use Corkscrew Sanctuary as part of their home range. We will begin in our visitor's center for an introduction featuring the beautiful photography of Ralph Arwood and Brian Hampton, as well as some video footage of Florida Panthers. We then will explore part of the boardwalk and a trail through the pine flatwoods while looking for signs of wildlife and discussing what is done at Corkscrew to protect the natural habitat for the benefit of panthers, other wildlife and people. 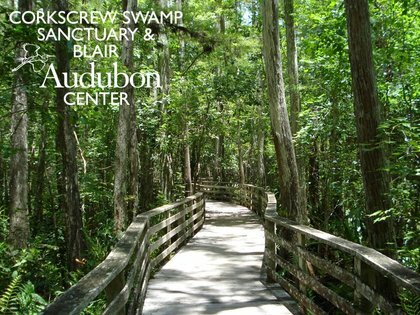 Where to Meet: Corkscrew Swamp Sanctuary Blair Audubon Center, located at 375 Sanctuary Road, Naples, Florida 34120. Limitations: Must be able to walk 2.5 miles and climb down a short set of steps. We will be walking for up to 2.5 hours. Additional Information: Restrooms and concessions are available in the Blair Audubon Center at the beginning and end of the tour. protection (hat, sunglasses, sunscreen), bug repellant and binoculars. What to Wear: Comfortable, closed-toe walking shoes, comfortable attire appropriate to the weather, and sun protection such as a hat and sunscreen. How to Register and Pay: Register and arrange payment by contacting Sally Stein at Corkscrew Swamp Sanctuary at 239-348-9151, ext. 112 or sstein@Audubon.org. Payment can be made by credit card or check. 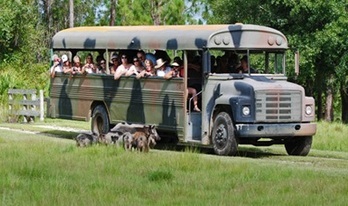 Description: Travel on a converted open-air school bus through Florida Habitats, see the local wildlife and learn about our working Cattle Ranch. Take a walk in the swamp on our boardwalk. Enjoy a 90-minute Tour through the Babcock Ranch and Telegraph Cypress Swamp. Experienced guides offer in-depth descriptions of birds, animals, plants, and the cattle and horses that are raised on the ranch. Visitors will see alligators and many other animals found in Southwest Florida. In the tour area you'll find a museum featuring Florida history, Babcock operations, and natural history artifacts. The museum itself was actually a movie set used by Warner Brothers in the 1995 film "Just Cause" (starring Sean Connery) that was filmed in part on Babcock Ranch. Our gift shop features items of special interest to Babcock Ranch, the Wilderness Tour and Florida wildlife. Our Country Store is open before and after tours. Directions to Meeting Place: From Naples: Travel I-75 north to exit 143. Go east on Bayshore Road/ State Road 78 for 3 miles. At traffic light (Lee Civic Center on left) turn left onto State Road 31 and travel for 9 miles. Babcock Wilderness Adventures' entrance is on the right. The Visitor's Area is 2.5 miles east from the entrance gate. Limitations: Must be able to climb the steps into the bus. No food or beverages other than water allowed on the tour. There is a picnic area available before and after your tour. Additional Information: You can bring your own picnic lunch or enjoy a lunch in our Gator Shack Restaurant, which is open seasonally. What to Bring: Bring your camera, water and bug spray. What to Wear: Dress for the weather: you'll be traveling on an open-air bus. How to Register and Pay: Please call 1-800-500-5583 and say you are interested in the “Get Back to Nature Tour” on Sunday, November 17th, 2013. Questions? Please visit www.babcockwilderness.com. Cost: $150 per adult, $130 per child (ages 5-11). Time: Departure times varies by pickup location: please see website. Maximum Attendees: Please call to inquire. 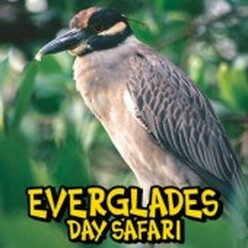 Description: The Everglades Day Safari offers an in-depth naturalist-guided day trip into the majestic Everglades! Every Everglades Day Safari adventure includes: roundtrip transportation from the greater Fort Myers or Fort Lauderdale areas, a well-educated, highly-trained, naturalist guide, a nature walk under the canopy of towering bald cypress, a scenic boat cruise into the Ten Thousand Islands mangrove forest in Everglades National Park, a delicious lunch featuring alligator appetizers, a wildlife drive through the pine savannahs and cypress forests of Big Cypress National Preserve, and a spectacular airboat ride through sawgrass prairies and pond apple forests. Also included is the 64-minute Wildlife of the Everglades DVD (one per booking). Directions to Meeting Place: Please visit website or call for pickup locations and directions. Limitations: Must be able to board a mini-van, airboat and tour boat (National Park boat is handicap accessible). Other limitations may apply: please call for information. No food or beverages other than water allowed on the tour. What to Wear: Dress for the weather: you'll be in and out of the tour vehicle to travel by airboat, tour boat, and walk a one-half mile boardwalk. Additional Information: For more information, please visit http://www.ecosafari.com/. How to Register and Pay: Register using the website listed above or call 1-800-472-3069. Description: The Fakahatchee Strand Preserve State Park is Florida's largest state park, and home to the largest population of rare and endangered orchids in the country. Join a naturalist guide into the strand, where you may see anything from birds to alligators, bears and even the elusive Florida panther in this beautiful park made famous by the bestselling novel 'The Orchid Thief' and the film 'Adaptation', which starred Nicholas Gage and Meryl Streep. The new “Ghost Rider” tram, named in honor of the famous Ghost Orchid found in the park, lets you look at wildlife and plants without needing to concentrate on the road. An experienced guide accompanies each ride and points out interesting aspects of the park. The trip lasts 2-½ hours with stops along the way. Where to Meet: The Park's office, located at 137 Coastline Drive, Copeland, Florida 34137. Directions to Meeting Place: From Naples: From Naples, travel south on US Hwy. 41 (the Tamiami Trail) until you reach SR29 (approximately 45 miles south of downtown Naples). Go north on SR29 approximately 2 miles to Janes Scenic Drive and make a left. Travel about 1/4 mile and make the sharp right hand turn in the road, proceeding another 1/2 mile until you reach Coastline Drive. Turn right and park in the marked area just before the office. Limitations: None: the tram is wheel-chair accessible. Additional Information: Restrooms available at beginning and end of the tour. There no concessions or restaurants at the park. What to Bring: A bottle of water is always a good idea and of course a camera to capture the beautiful sights of the Fakahatchee. Bring sun protection (hat, sunglasses, sunscreen), bug repellant and any food you may desire: there are no vending or concession facilities at the park. What to Wear: light weight clothing, preferably long-sleeved shirt and long pants, comfortable shoes, a hat, and sunglasses.